What materials do you most need to begin a needlepunch adventure? Just think of it as appetizers ...crackers and toppings! You just need a good base and some materials to place on top. 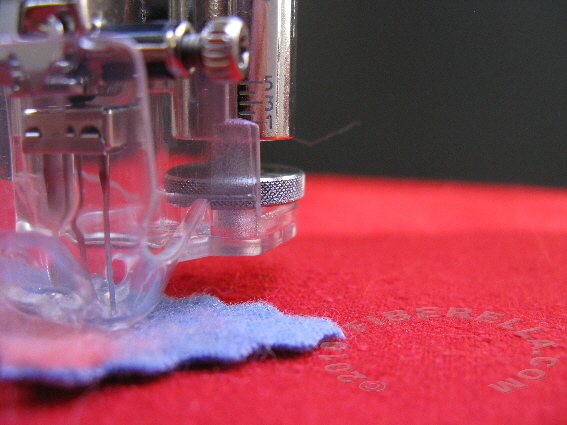 Fibers, the most versatile of all in needlepunch, can be used for either, or both. Learn how to expand your range of materials, most appealing and suitable for your creative style, and without needle breakage ... in the Fiber Cafe One. My best short advice here, not knowing your needle brand ...stick with fabric scraps that have a high, if not full percentage of animal fiber content like wool or silk. Want even more fun? Yarns come to mind. Explore. Watch out for those dyed silk cocoons though... you can easily break a barbed needle! Note: Avoid any materials that are hard, have lumps, or bumps, Also avoid lycra and rubbery upholstery backings. These can break needles. It's true. I *LOVE* pure merino for its soft hand, color depth and beautiful color blends. It also punches well with most brands of felting needles out there. For an amazing effect, try out some sparkle nylon. Above all... explore freely and observe your results. If you could only have one material for needlepunch, I recommend the versatility fiber! In general* try quality cotton (not too-tightly woven quilting fabric), pure wool and a less expensive silk (proven to be highly usable with all brands of barbed needles), raw silk, AKA silk noile. These are three good starting places. Also consider battings and stabilizers as having potential..
*Selections can and should vary because of your specific needle types. More about that in Fiber Cafe One. Commercial felt? I suggest the classic all wool style. I don't often recommend rayon/wool blended commercial felt. Why not? Because the combined fibers will each shrink at a different rate under the barbed needles, causing an undesirable rippling of the base fabric. Don't get me wrong. I LIKE texture; even in the base fabric at times. In my opinion, this material performs best when used as a topping; or as a base when using stitch to attach any offsite (already punched) embellishments.